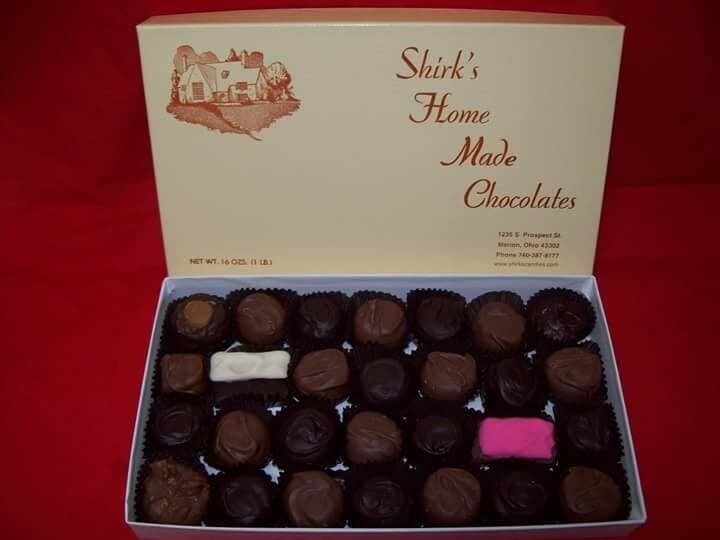 ﻿ Shirk's Homemade Candies - Ohio. Find It Here. A locally owned and operated tradition in Marion since 1932. Choose from a wall of delicious hand-dipped chocolates in unique packaging.I have been in love with Shirks since my Mom Dad got it for my brother and I for every Christmas and Easter. I have continued the tradition with my boys and always have to get my Mom a pecan log or box of chocolates for all special occasions. Please consider getting some for your family this Easter and make it a family tradition in your family, too! You will not be disappointed and it is so much better than anything you can get at the regular stores, your family deserves the BEST! Plus, shopping local is the way to go, keep this local family in business for generations to come!